Well, what can I say .. it's been a loooonnnnggg week. Ups and downs ... 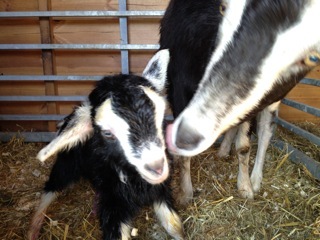 So, time for a catch up on all the news from the goat shed - long overdue! And before you all start to think impure thoughts .. No, I am not having an affair. This is Tom. He is our first student of 2012. 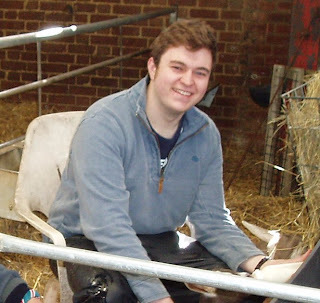 2nd year vet student from the University of Nottingham. And what a fantastic chap he turned out to be! He arrived on Sunday evening, stepped out of his car and got straight into feeding babies, helping with milking and happily chucking hay and straw around for the milkers. He was staying at my house for the week and so I didn't feel that it would be polite to set up camp in my front room every night in order to get a decent broadband connection, so I was resigned to the caravan for the whole week. Totally unable to get a mobile broadband signal, I was therefore out of blogging range. That's my excuse and I'm sticking to it. Those of you who have proper townie broadband have absolutely no idea how utterly frustrating it is not to have any kind of internet connection when you need one! So, we are all still reeling from the sad demise of little Hugo last Saturday morning. And as an added shock, we lost his brother the following day, also very suddenly. I was at market and got a call from David to say that he had just dropped down dead after having his morning milk. That leaves the sister - needless to say, we have all been keeping a very close eye on her this week and she has been getting special attention to make sure that she is OK. So far, so good .. He was a great asset to the goat shed this week and we all thoroughly enjoyed his company. Francesca was grateful for the extra pair of hands with all those babies! Although the kids in this pen have a low wall to run along, they love to have a new straw bale to jump on. Just how many kids can you fit on one bale?! 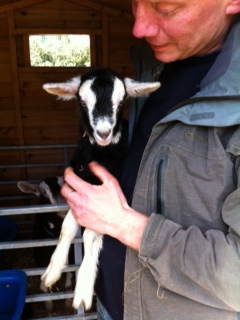 We are going to let them settle in over Easter and then go and visit them once the school holidays are over. What else? Oh yes ... Flora and her little foster daughter. Well, Flora has got so much better that we decided it was time to try her back in the main pen with all the other milkers. We moved her back in there yesterday and she is getting along just fine. She has also managed to walk up into the milking parlour and seems happy being back with all her friends again. Her little foster daughter (whom we have called Florie, after her foster mum) is now living with lots of other kids her own age. She spent the entire day yesterday running around and playing with them - she was absolutely exhausted by the end of the day and we found her fast asleep at feeding time! So, it's Goodnight from me! Back off up to the goat shed to see what the night brings.